Gavrila Romanovich Derzhavin (Гаври́ла Рома́нович Держа́вин, July 14, 1743 – July 20, 1816) was Russia's finest eighteenth century poet, and generally considered the greatest Russian poet before Alexander Pushkin. Due to Pushkin's role as the founder of modern Russian poetry and the Russian literary language, Derzhavin's works are traditionally assigned to the period of literary Classicism, but his best verse is full of antitheses and conflicting sounds in a manner more reminiscent of the English poet, John Donne, and the Metaphysical poets. Derzhavin was born in Kazan. His father, a Tatar, was a poor country squire who died when Gavrila was still young. He received only a little formal education at the gymnasium in Kazan, before he left for Petersburg as a Private in the Guards. There he rose to the highest offices of state under Catherine the Great. He first impressed his commanders during the Pugachev rebellion. Politically astute, his career advanced when he left the military service for civil service. He rose to the positions of Governor of Olonets (1784) and Tambov (1785), personal secretary to the empress (1791), President of the College of Commerce (1794), and finally became the Minister of Justice (1802). He retired in 1803 and spent the rest of his life in the country estate at Zvanka near Novgorod, writing idylls and anacreontic verse. He died in 1816 and was buried in the Khutyn Monastery near Zvanka, reburied by the Soviets in the Novgorod Kremlin and then re-interred at Khutyn. 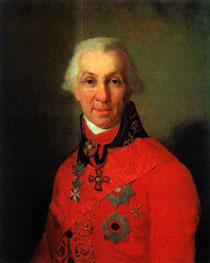 Derzhavin is best remembered for his odes dedicated to the empress and other of his fellow courtiers. He came to the empress's attention with his ode "Felitsa," which flattered her while mocking some of her courtiers. He paid little attention to the prevailing system of poetic genres, and many a time would fill an ode with mournful, humorous, or satiric contents. His images were often jarring. In his grand ode to the empress, for instance, he mentions searching for fleas in his wife's hair and compares his own poetry to lemonade. Unlike other Classicist poets, Derzhavin found delight in carefully chosen detail, like the color of wallpaper in his bedroom or a poetical inventory of his daily meal. He believed that the melodious French language was a language of harmony, while the less sonorous Russian was a language of conflict. Although he relished harmonious alliterations, sometimes he would deliberately use the instrument of his verse to create the effect of cacophony. According to the influential Russian literary critic, D.S. Mirsky, Derzhavin was first rate poet, but, unlike Pushkin, did not leave a lasting influence on poetic style or influence a poetic school. "Derzhavin's poetry is a universe of amazing richness; its only drawback was that the great poet was of no use either as a master or as an example. He did nothing to raise the level of literary taste or to improve the literary language, and as for his poetical flights, it was obviously impossible to follow him into those giddy spheres." Nevertheless, Nikolay Nekrasov professed to follow Derzhavin rather than Pushkin, and Derzhavin's line of broken rhythms was continued by Marina Tsvetaeva in the twentieth century. 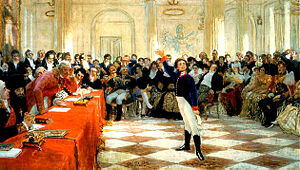 14-year-old Pushkin reciting his poem before old Derzhavin in the Tsarskoye Selo Lyceum (1911 painting by Ilya Repin). ↑ Russian Poetry.net, On the Death of Prince Meschersky. Retrieved August 3, 2007; Russian poetry.net, God. Retrieved August 3, 2007; Russian Poetry.net, The Bullfinch. Retrieved August 3, 2007. Grot, Y.K. Life of Derzhavin. 1883. Russian Poetry.net. Gavrila Romanovich Derzhavin. History of "Gavrila Romanovich Derzhavin"
This page was last modified on 23 May 2017, at 22:14.